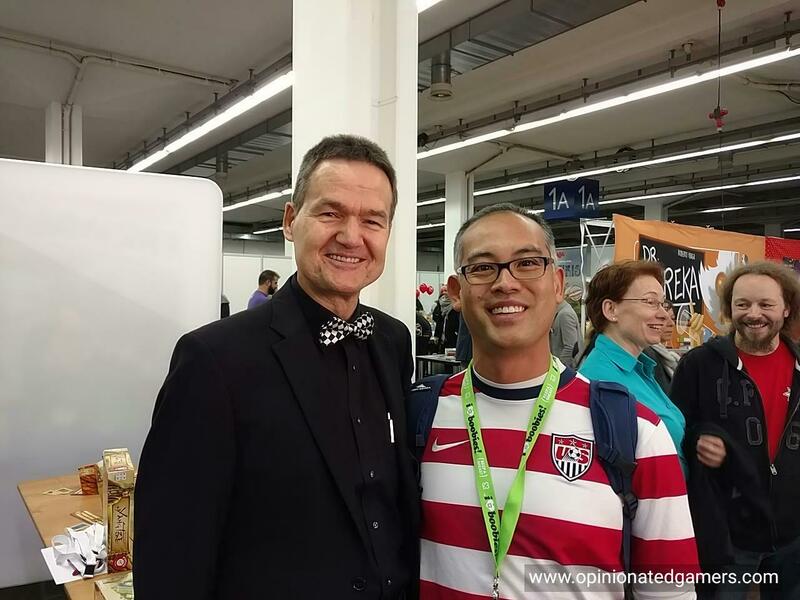 Blue Orange has been making a steady move into the adult Eurogame market, and this year, they are bringing a design from Herr Knizia to the market. I was given an advance copy of this new summer 2018 release, Blue Lagoon, to play this summer. 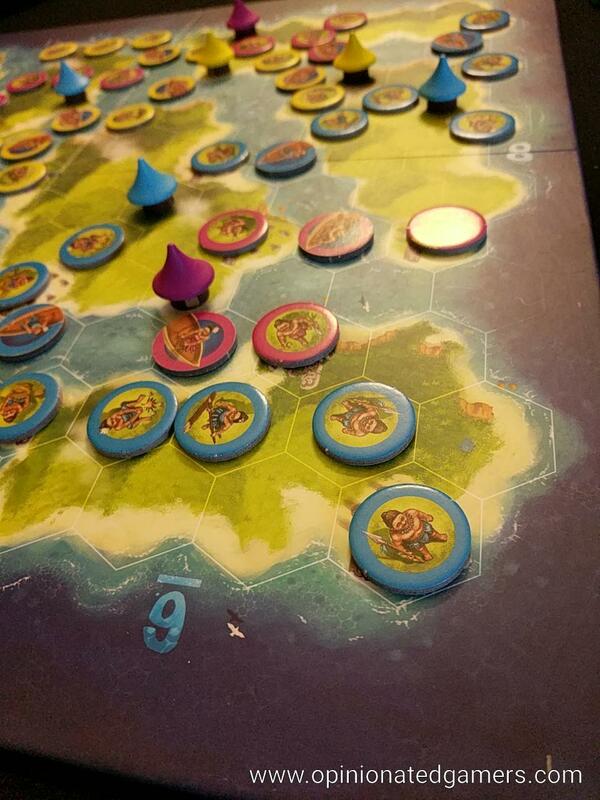 In this game, each player acts as the head of a tribe trying to explore and settle a group of islands in the Blue Lagoon. 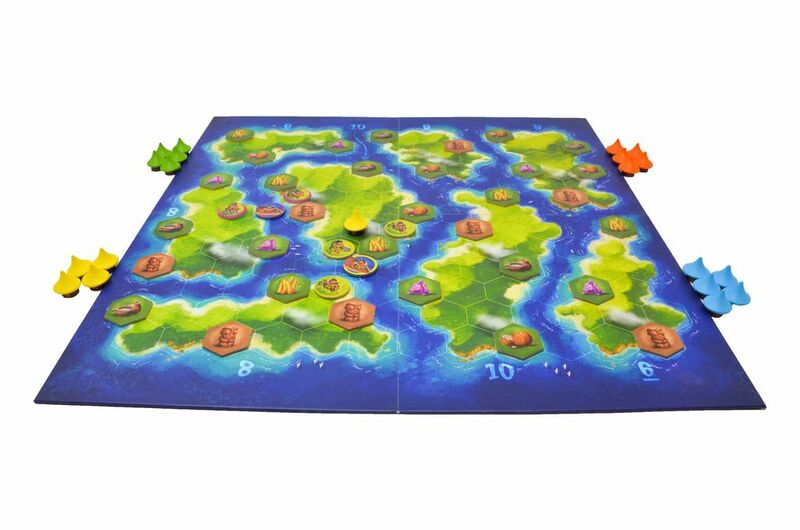 The board shows a grouping of 8 islands of various sizes, conveniently separated by a single hex worth of water on all sides. There are stone circles all over the islands. On each of these spots, a random resource (coconut, bamboo, water, gem, statue) is placed in game setup. Each player gets a supply of Villager discs as well as Huts in their color. The game is played over two broad phases – the Exploration Phase and the Settlement Phase. In the Exploration phase, players start with no pieces on the board. The first Villager disc is placed on any unoccupied sea space on the board. All following pieces must either be placed on other sea spaces OR on a land space which is directly adjacent to a previous placed piece of that player’s color. When placing on a land space, the player can choose to play either a Villager disc OR a hut. If a piece is placed on a land space that has a resource on it, that resource is collected and placed in the player’s supply. Each space on the board can only hold one player piece. Majorities – examine each of the eight islands. 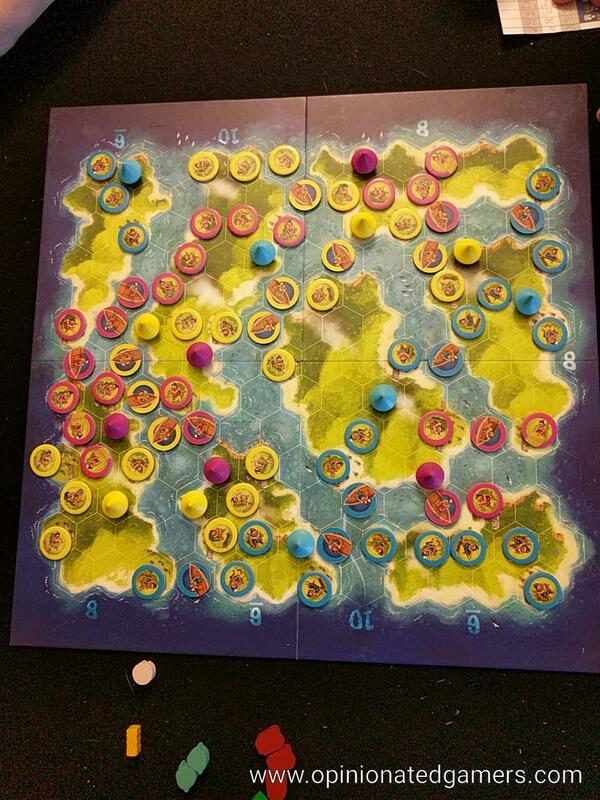 The player with the most pieces on each island scores 6/8/10 points (value of each island printed on the board). Ties divide points. It sounds a bit complicated, but there is a handy score sheet to help you get through the different steps in the scoring. Once scoring is completed, players take back all of their villager discs. All huts remain on the board EXCEPT for those placed on stone circle spaces; huts on stone circles (as well as any unplayed huts) are removed from the game. 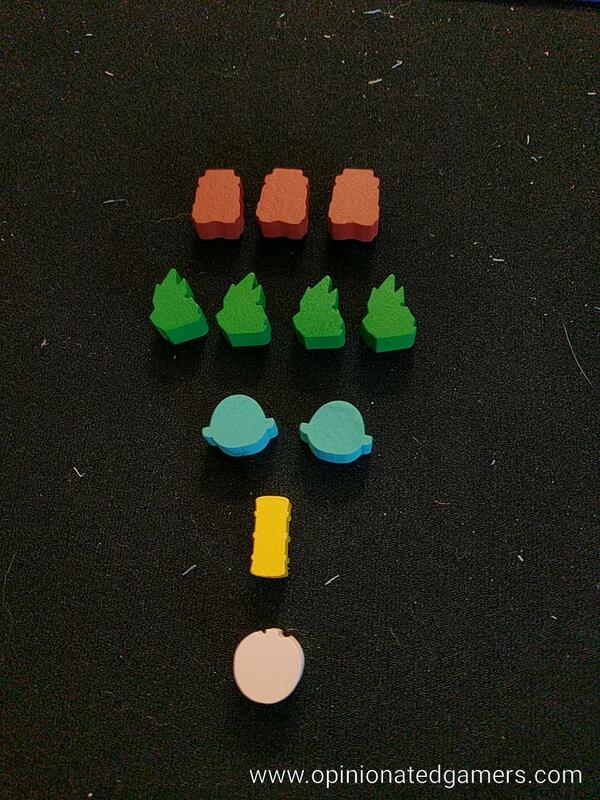 The resources and statues are again randomized, and one each is placed on each stone circle space on the board to set up for the Settlement Phase. The Settlement Phase is very similar in play; the main difference is that all play must now start from the locations of the huts placed in the first phase – you cannot just start in any sea space in this phase. Players will only play Villager discs in the second phase. The start player of this phase is the next player in turn order from wherever the first phase ended. The phase ends when all the resources/statues are collected OR all players have played all their Villagers. There is another scoring round after the Settlement phase which is identical to the first scoring round. The player with the most points wins the game. If there is a tie, the player with the highest number of resources+statues collected in the final Phase wins the game. 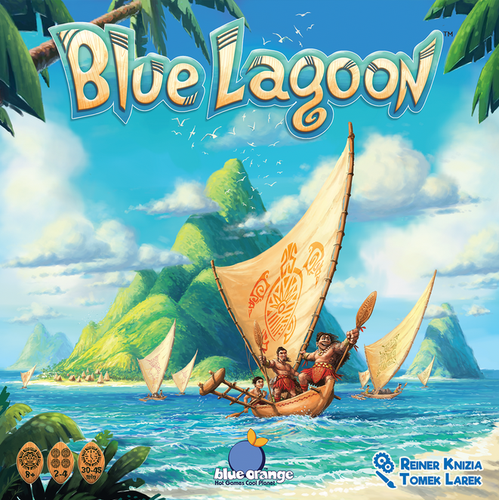 Blue Lagoon is a game which feels both familiar and fresh at the same time. It is a game that keeps the players constantly engaged in a tight battle for resources and area control. The scoring system in the game forces players to pay attention to both elements, and the small size of the board ensures that you’ll be worrying about your opponents from the earliest stages of the game. The incremental growth of the Villager chains as well as the constant fight for land control is extremely reminiscent of Through the Desert. I feel like you have a bit more flexibility here as you can start a new piece in any sea space during the Exploration phase. The placement of the second phase is more like TtD as you are limited to your previously played huts, but it’s nice to have that first phase where you are both competing for resources as well as setting yourself up for the second phase. So far, our games have shown a nice balance between land control and resources. I have seen both strategies do well in scoring. 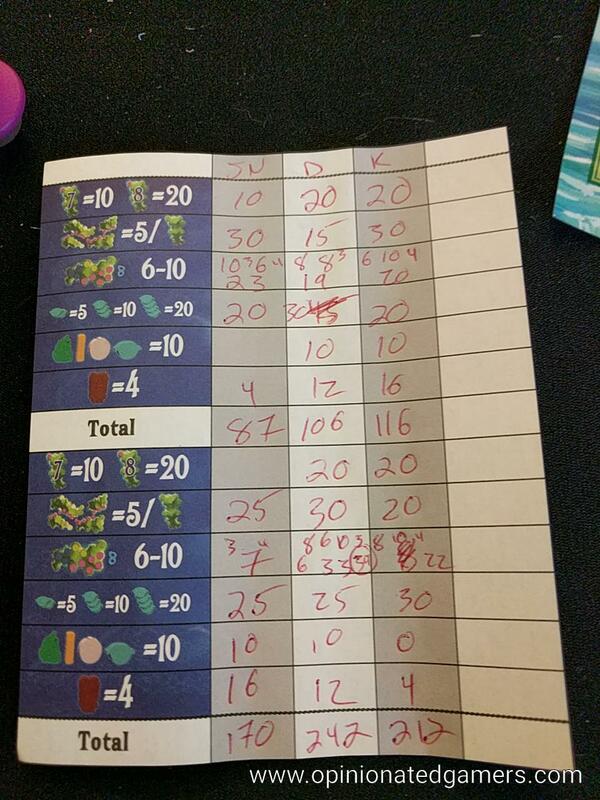 And, while some of the convoluted Knizia scoring systems are sometimes too much for me, this one is easy to understand and gives some value to just about every play – the trick in this game is figuring out which move works best for you. The complexity of scoring also prevents our group from trying to calculate the scores near the end of the game to find the single most optimal play – you are forced to play by feel which helps keep the game moving along. Each individual turn only takes a few seconds, and it’s nice to watch the board slowly and organically grow. By the middle of the phase, you’ll likely be in a number of different territory battles or races for a resource, and you’ll often be faced with difficult decisions as you’ll only be able to play one piece each turn, and you’ll have to prioritize which battle to fight each turn. As I alluded to earlier, there is also a nice layering of strategy in that your play in the first Phase directly affects your starting locations in the second phase. I think Blue Orange has a hit on their hands here, and this is a worthy addition to their growing line of strategy games. This one is slated for release at GenCon 2018, and I could see it having the same rapid success that Photosynthesis had last year at the same show. James Nathan (2 plays with a preview copy): I played Through the Desert once many years ago, but do not have fond memories, and the memories I do have are vague. For me, Blue Lagoon feels like a mashup of Kingdom Builder –with all scoring variants in play simultaneously– and with a Brass style “reset” halfway through. I’ve played once 3 player and once 4 player and just love it. So far, I’ve proven to be a poor judge of how to prioritize the different scoring possibilities, and how to read the board as to which would be prudent. In my 4 player game, I had a moment of schadenfreude at one player’s hut placement going into the second round –I won’t give details as I think it amounts to a strategy-spoiler, but this player saw some Through the Desert lineage that I had overlooked and ran away with the second half scoring. The board is tight, especially in a 4-player game, and your attention is required in many places at once. Do I place here as a precaution to keep pieces connected? Do I place here as a gambit to reach these resources or that island? If I place here, will the next player follow suit to cut off this other player? What is that player’s intention with that last move? I need that resource and this other resource, but both of those players are now next to them, which is my immediate priority? Slim rules overhead, but tough decisions abound. Agreed! TtD was too abstract and burny for my little brain but this packs a similar (but softer) punch in a cute little, digestible package! The image at the top shows the goods used to be hexagonal tokens rather than wooden bits that the published game has. I suspected this was how the game was originally designed. With the wooden pieces, you can sort of feel the types of pieces in the bag before pulling them out.